Struggling to find a simple gift idea for the holiday season? Here are 40 No Hassle Gift Ideas to make your holiday shopping a breeze. I don’t know about you, but I love the Christmas season. There is so much to look forward to. It’s the season of giving and I love to give. I am so ready to get my Christmas on! While is it a little too early to start decking the halls, I like to get a jump start on my shopping so I can stress less. It makes the season more enjoyable. Let’s face it, sometimes Christmas shopping can be stressful. I am sure the “what should I buy Aunt Sally?” dilemma has hit us all at one time or another. Have you made your Christmas shopping list yet? When it comes to shopping, I like no hassle ideas. Sometimes simpler is better. So if you are struggling to find the perfect present this holiday season, I have just made your shopping a little easier. These 40 No Hassle Gift Ideas take “what should I buy?” out of the Christmas Shopping equation. This makes “making your list and checking it twice” so much more easy and fun! 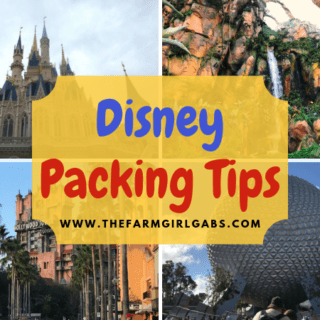 Most of these are clutter-free gift ideas too! Dinner & A Movie Gift Card – Perfect for the night out as a family or with a date. Audible Membership – For the busy person who doesn’t always have time to sit down and read, an Audible membership allows you to listen to books on the go. Coffee Gift Cards – I would be lost without coffee in my life. A gift card to a coffee shop is a perfect for our coffee-loving friends. Redbox Gift Certificates – Make it a movie night. Better yet, include a Redbox certificate wrapped up with some candy and popcorn. Echo – This compact powerful speaker is da bomb! Not only does she play some pretty cool tunes, but can make lists, tell you a joke and the current weather…and that is just a few of her features. Restaurant Gift Cards – Gift cards to a local eatery or national chain are perfect. I love getting meal cards. Gives me one night off from cooking. Chick Fil A Calendar – Get some inspiration from the cows. This 12-month calendar includes a promotional card that, once activated, may be redeemed each month throughout 2016 for the free featured offer(s) of the month. Amazon Gift Card – An Amazon Gift Card is the perfect gift for the difficult person on your list. Surely they will be able to find something on Amazon. Homemade food gifts – Food gifts add a personal touch to gift giving. Check out these Cookies In A Jar that I shared on the blog. This is just one fun food gift idea you can create. A DIY Yuletide Hostess Gift is the perfect gift for the person who loves to cook or host parties. Take a pretty holiday serving platter and top it with some kitchen utencils, dish towels and candy. Perfecto! Spa Day – A gift card for a local spa is perfect for someone in need of some pampering. Homemade Bath Scrubs – Help someone create their own spa day at home. Put together a gift basket filled with spa essentials like this homemade Peppermint Sugar Scrub and Lavender Bath Salts. If they happen to be a Disney fan, throw some of these Mickey Bath Bombs in it too. iTunes Gift Card – This is a great option for iPhone lovers. Buy a song or buy an app, an iTunes gift card covers it all. P.S. They make great stocking stuffers for teens too. Mani / Pedi Pampering – Treat someone special to a manicure and pedicure. Salon / Haircut – Continue with the pampering with a gift card to their favorite hair salon. It’s amazing how great a fresh cut or color can make someone feel. Sports Tickets – I am sure the sports fan in your life would love tickets to see their favorite team play. Subscription Boxes – Subscription boxes like Birch Box, Popsugar Must Have, Stitch Fix and Globe In to make a few are a hot trend right now. Netflix – Who doesn’t love a good binge watch. Netflix is the perfect place to do it. Gym Membership – A gift membership to a local gym is the perfect way to start working on those New Year’s resolutions. Gardening Gift Basket – Have a gardener in your life? Throw together a simple gardening basket like this one. Seed packets, gloves and a few gardening tools are all it takes. Amusement Park Gift Certificates – Who is ready for some family fun? How about a gift card to either a local or national theme park to add to the fun. AAA membership – Stay safe on the road with an AAA membership. Pair it with this handy car emergency kit . Amazon Prime Membership – Amazon is totally “da bomb”. Where else can you shop for practically anything from the comfort of your home? An Amazon Prime Membership makes it even better because your items ship for free! Free Babysitting – Parenting is a tough job. Offer to take a friends kids for a few hours so they can enjoy some time together to run errands or enjoy a meal in quiet. Art Supplies – I may be a little biased because I have an artist in the family, but art supplies are the perfect for any age. Adult coloring books and some colored pencils for the parents and a nice art set for the kids will keep everyone occupied for hours. Puzzles – Puzzles are another great way to keep busy. I love a good puzzle. Its the perfect gift for kids and adults . Grocery Store Gift Cards – A gift card to your local grocery store comes in pretty handy. eCourse 0r Online Class – Give the gift of learning. Find an online course to give. Sites like Craftsy have really cool classes too. Classic Board Games – Who’s up for a family game night? We love to play family games. It’s a great bonding experience and just a tad bit competitive too. Tickets to a local theater or broadway play – Support the arts. Tickets to a local theater, and off-broadway production or a Broadway show are perfect for the perfoming arts fan. Satellite Radio Subscription – A Satellite Radio Subscription is perfect for the music lover. Etsy Gift Card – Etsy is a creative person’s paradise. 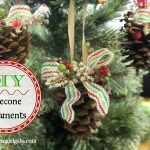 Lots of handmade ideas of all kinds here. Concert Tickets – Surprise someone with tickets to a local concert or to see their favorite artist. Home Improvement Gift Card – A Home Improvement Gift Card is the perfect all-purpose gift. Whether you own or rent your home, these gift cards will always come in handy. Books – I love to give books. Books educate us, inspire us and can even whisk us away to far away lands. Money for College Fund – Whether you have a college-bound child or a young one still in diapers, money for college or a college fund is a great gift idea. Magazine Subscription – A subscription to a favorite magazine it a great idea! There you have it! 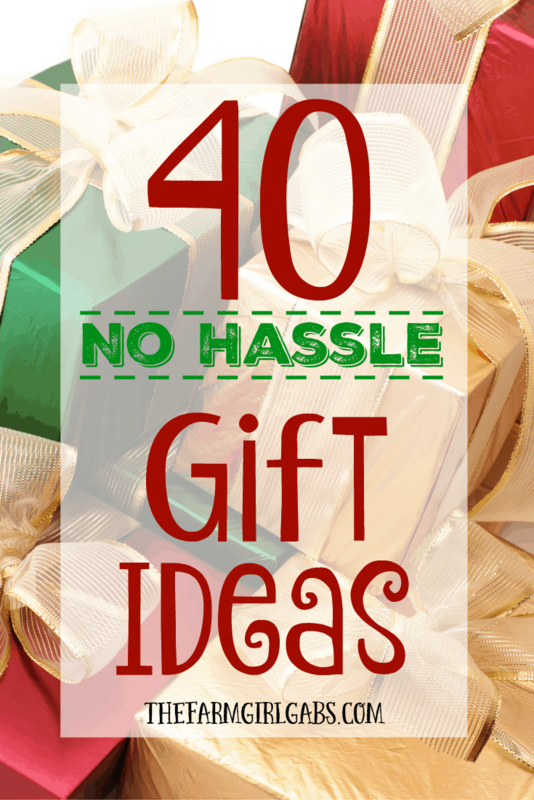 Forty No Hassel Gift Ideas. As you tackle that holiday shopping list, think about these hassle free (and mostly clutter-free) gift ideas!